It’s a fact. Life is stressful. So make stress useful. Work, home, school-no one is immune. Good news, bad news, even no news can trigger stress. Stress is, well, STRESSFUL! But, YOU can handle it! And this book is here to show you how! Follow the 10, easy steps inside and learn how to be your best self. Other books may give you quick tips and promise success, but You Can Handle It tells you why these techniques work on the brain, and gives you step-by-step directions, worksheets, and scripts that will make implementing these methods feel effortless. 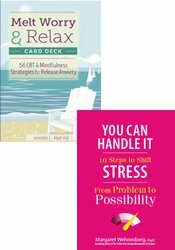 In You Can Handle it, Dr. Wehrenberg offers realistic, simple and highly satisfying how-to’s to eliminate bad stress from your life, and how to use the good stress for leverage in all arenas of your life.